This super strong steel pin hinge handle is ideal for medium sized street and construction signs up to 24" wide and 48" high. Hinge Handles are made with a solid-steel shaft and high-density polyethelene tabs that will flex, but not break, even in cold weather. Every Hinge Handle comes with a lifetime warranty. Hinge Handles can be used with substrates of any kind up to 1/2" thick. The simple design makes installing them to A-frame signs fast and easy. (Assembly takes just a couple minutes.) 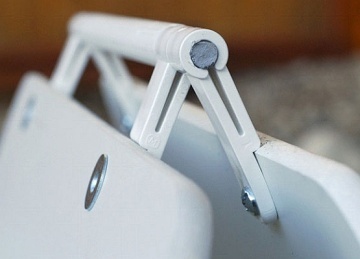 Thanks to their built-in handle, Hinge Handles make A-frame signs much easier to carry. This hinge Handle has 330 degrees of rotation so all four sides can be used for signage. Example: one side "Open House" flip over second side "Just Listed". Contact us for more information or come and see them on display in our showroom. Also, ask us about anchor stakes to secure your sandwich boards and reduce loss or damage. Sandwich boards (also referred to as A-frame signs) are traditionally used to display lunch menu items for restaurants and are put out on the sidewalk. However, these types of signs are now also often used to advertise homes for sale, business specials, special events etc. A-frame display stands can be made from wood (outdoor plywood), metal or plastic. The metal and plastic units are designed to allow for swapping out of the graphic panels without any tools. This is a great solution if your message changes often. The graphic panels can be printed with a different image on each side so that you can lift them out and turn them over to display the other side with a different message.